As one of the few plastic surgeons to be distinguished on the Houstonia list, Dr. Boynton says he is both proud and grateful to have received this recognition from his medical peers for the second year in a row. He adds that he will continue striving to provide the highest standards of excellence at Boynton Plastic Surgery, and he hopes those considering cosmetic or reconstructive plastic surgery will view this recent honor as another testament to his devotion to exceptional patient care. 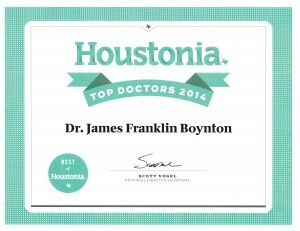 For more information about the 2014 Houstonia “Top Doctors” list, or to schedule a consultation with Dr. Boynton, please contact our office today.